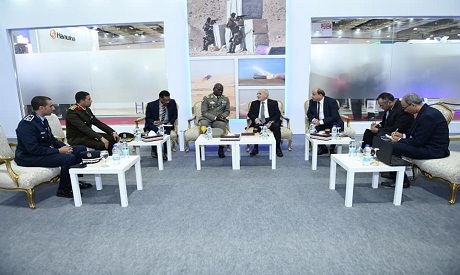 Military Production Minister Mohamed El-Assar held talks with Mali’s army chief of staff Brigadier General M'Bemba Moussa Keïta on Tuesday, on the margins of Egypt’s first defence expo, EDEX 2018. El-Assar asserted that EDEX - which opened on Monday and will close on Wednesday - is meant to review vistas of cooperation with friendly states, especially in Africa. He noted that the talks tackled means of fostering cooperation with Mali in the military manufacturing domain. Keïta said that EDEX will open new vistas of cooperation between Egyptian and international companies in the defence and security fields. Organising the event under the wise political leadership of Egypt underscores the importance of rallying efforts in the face of extremism and terrorism, he said. Keïta commended on the outstanding technological potentials of military and defence equipment produced at Egyptian military factories.